KONG Hoopla is a fun and interactive toy for your trusty pet. The horseshoe and bone have two rings around them that can be slid around. This allows your dog to play with the toy in various ways. Because the toy has various textures, it stimulates your dog's natural chewing instincts. KONG Hoopla will provide your dog with lots of entertainment. The horseshoe and bone have two rings that can be slid around. This makes the toy very interesting for your dog. The different textures stimulate your dog's chewing instinct. KONG has many more fun toys for your dog. View the entire KONG range here! 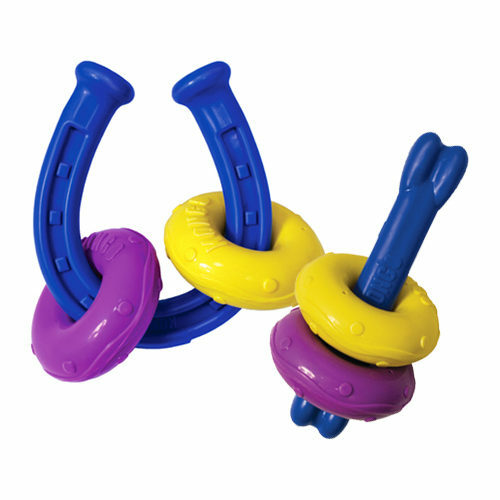 Have you used KONG Hoopla before? Let us know what you think about this product.